So. I thought March might be a good month to jump in a few fun things. It’s reading month or something similarish (Wow, I’m even too lazy to double-check this for my post) and it’s national health or nutrition awareness month (or something similar – see comment about “laziness” above), which I know about because one of my besties is a nutritionist. ANYWAY. I have a list of adult books I’d like to read (I KNOW, so weird) and some MG books and some YA books. We’ll see how I do digging into my TBR. And the other thing I’m doing, and that I’ve been asked a ton of questions about, is I’m going meatless. I really didn’t think it was that big of a deal. There are a LOT of vegetarians out there. I read this book YEARS ago, and it changed the way I ate. Hugely. I’m amazed all the time that people don’t know where their food comes from. That people don’t read labels. Did you know that sometimes lunchmeat has INGREDIENTS?? And not just bologna, salami, and other obvious choices. I mean, gross. There are things in our food THAT ARE NOT FOOD. This book is a fast read and a good resource (though I’m sure a few things have changed since its publication). 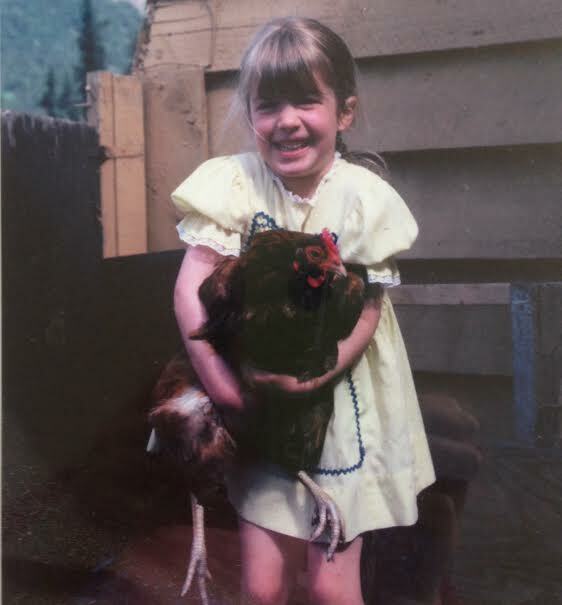 I grew up raising chickens. This is a lesson that has always stuck with me. I’m not a vegetarian. I probably never will be. If my family was hungry, I know I could kill an animal for food. But I’m amazed at how much meat we eat without giving it a second thought. I was at Qdoba with Mike the other day (I eat far too much of their food but it is so salty and spicy and delicious) and in the short time we were in line, they re-filled their chicken on the line FOUR TIMES. This is one Qdoba, in Wasilla, Alaska. Four times. How many chickens was that? I saw a picture of a pig farm that almost made me cry. It also made me feel a lot better about the pigs we butchered when I was a kid. Our pigs had a fun life before they became delicious. (My mom will probably point out that I ate none of those pigs or any other pigs for a very long time). I buy almost all my meat from local farmers/butchers, and the horrid way our “meat animals” are treated is why. Meat would also be a LOT more expensive if the animals were treated better, but now we’re into economics and supply and demand, and that walks right into politics, and I’m NOT going there…lol. Vegatarians aren’t bad. People who eat meat aren’t bad. I think the whole point of my month without meat is to show that we probably need about a half or a third of the amount of meat we consume, and to show that being vegetarian, even when you’re not used to it, isn’t as hard as you think. So. I posted this because I’ve had a LOT of people ask. Also. Read the book I mentioned above or something similar. Know where your food comes from. Eat healthier. Your body deserves good food. It also deserves comfort food, and food that makes you happy. I’m such a huge believer in moderation in all things except LOVE (awwwww). They’ve got the book in one of our libraries around here, so I’ll have to go get it. My kids are almost vegetarians. Okay, not really, but they don’t eat much meat. Even though it’s served to them. Of course you deep fry it, then they love it. But in general, they don’t eat much. I could probably cut back a little too. More fruits and vegetables are just a good way to go. I was a vegetarian for 11 years, then I started working as a chef and started eating meat again (I realized I didn’t like meat because my mother didn’t cook it very well), but now I’m mainly vegetarian again because my partner is vegetarian. I save eating meat for when I go out to restaurants and can have something amazing. The kids occasionally badger me for meat, but usually they’re happy enough to wait until they go to grandma’s to gorge on it.